Linagliptin is a member of “Dipeptidyl Peptidase-4” (DPP-4) inhibitors and may be preferred for certain advantages. We present a type 2 diabetes case with developed skin findings after initiation of linagliptin. A 66-year-old type 2 diabetic woman with coronary heart disease for 10 years was admitted to our clinic with dry mouth, polydipsia and polyuria. She was on metformin, acetylsalicylic acid and nitrate treatment. The physical examination was unremarkable. On admission, blood glucose was 319 mg/dL, urine ketone was negative, serum biochemistry and arterial blood gas results were within normal limits. Linagliptin was added to treatment after glycemic regulation was achieved with intensive insulin regimen. On the second day of linagliptin treatment, palpable purpuralike lesions were seen in the lower and upper extremities. Linagliptin was considered as an etiological factor. After discontinuation of linagliptin, the lesions gradually regressed. DPP-4 inhibitors may lead to some dermatological side effects due to inhibition of other DPP enzymes. To the best of our knowledge, our case is the first case in the literature to develop palpable purpura after linagliptin treatment. Several oral antidiabetic agents have been widely used for the management of type 2 diabetes mellitus. In clinical practice, some factors, such as age, body weight, clinical features, risk of hypoglycemia, and side effects of the drugs, lead us to choose specific agents or a combination of these agents. In addition to these factors, comorbid conditions, such as cardiovascular disorders, become more important for practitioners when choosing therapeutic agent for diabetes. Hence, cardiovascular safety studies become a prerequisite for some new oral antidiabetic drugs that have emerged in last years. One of the new classes of these agents is “Dipeptidyl Peptidase-4 inhibitors” (DPP-4 inhibitors). Studies regarding cardiovascular safety of this class of agents have been reported in recent years (1). Several types of DPP-4 inhibitors are available worldwide. The DPP-4 inhibitors block DPP-4 enzyme and hence inhibit degradation and increase the serum concentrations of both “Glucagon-like Peptide-1” and “Glucose-dependent Insulinotropic Peptide”. Several reports showed that some side effects, such as pharyngitis, arthralgia, headache, myalgia, or pancreatitis, could be observed in patients using a member of DPP-4 inhibitor (2,3). Post-marketing reports demonstrated skin findings such as rash or Stevens-Johnson syndrome, based on therapeutic use of DPP-4 inhibitors. Some of the side effects of DPP-4 inhibitors may be due to the blockage of other subclasses of DPP enzyme family. Especially, some DPP-4 inhibitors have an electrophilic trap making them unstable, and these have a low selectivity against DPP-8 and DPP-9 (4). One study showed that DPP-9 enzyme was expressed in skin cells (5). However, since DPP-8 and DPP-9 enzymes are also responsible for T-cell activation, inhibition of these enzymes by DPP-4 inhibitors may cause side effects such as skin reactions (4). Therefore, the selectivity of the drug to DPP-4 enzyme becomes evident when evaluating its side effects. Linagliptin is one of the members of DPP-4 inhibitors that have been approved by FDA in May 2011 and is often preferred due to some advantages over the others; for example, dose reduction is not needed in patients with decreased renal function. Linagliptin, a selective inhibitor for DPP-4, inhibits DPP-4 enzyme with a 40.000-fold and >10.000-fold higher activity than DPP-8 and DPP-9, respectively (6). It has a greater potency than other DPP-4 inhibitors (7). Several case reports have demonstrated some skin reactions associated with the use of DPP-4 inhibitors such as sitagliptin, vildagliptin and saxagliptin. Lower rates of skin findings associated with linagliptin use may be due to its higher selectivity. To the best of our knowledge, only one case report showed a skin reaction like blistering and ulceration after linagliptin treatment (8). We present a type 2 diabetes case with palpable purpura like lesions after the initiation of linagliptin. A 66-year-old woman with a history of type 2 diabetes for ten years was admitted to our clinic with complaints of dry mouth, polydipsia and polyuria. Recently, she experienced severe emotional stress due to social issues. She also had history of coronary heart disease confirmed by coronary angiography. She did not have any other comorbid disease. She was taking metformin (1000 mg, twice a day), acetylsalicylic acid (100 mg, once a day), and oral nitrate (20 mg, twice a day) for ten years. On physical examination, vital signs were stable. Examinations of cardiovascular, pulmonary and gastrointestinal systems were normal. She had no skin rash or lesion. Routine laboratory tests were performed. White blood cell, hemoglobin (Hb), and platelet counts were 3900/µL, 13.6 g/dL, and 203x103/µL, respectively. Blood glucose was 319 mg/dL and HbA1c was 5.7% (39 mmol/mol). Other biochemical tests were as follows: BUN=21.44 mg/dL, creatinine=0.78 mg/dL, ALT=25 U/L, AST=44 U/L, ALP=106 U/L, GGT=40 U/L, direct/total bilirubin=0.12/0.34 mg/dL, Na=134 mmol/L, K=5.1 mmol/L, Cl=101 mmol/L, Ca=9.3 mg/dL, P=2.9 mg/dL, albumin=3.9 g/dL, total protein=7.5 g/dL, high-density lipoprotein=43 mg/dL, low-density lipoprotein=109 mg/dL, triglyceride=110 mg/dL and total cholesterol=175 mg/dL. Coagulation parameters were as follows: INR=1, activated partial thromboplastin time=30.2 seconds. Arterial blood gas analysis revealed mild metabolic acidosis with pH=7.31, HCO3=18.6, mmol/L, pCO2=35 mmHg and pO2=64.7 mmHg. She had no ketonuria, but glycosuria was determined as 4+. She had microalbuminuria, determined as urinary albumin/creatinine ratio 80 mg/g. We managed the patient with the diagnosis of uncontrolled diabetes. First, we initiated a basal-bolus intensive insulin regimen with strict glucose monitoring to improve uncontrolled hyperglycemia. We also continued treatment with metformin in addition to intensive insulin regimen. Initial insulin doses were pre-prandial 3x6 units glulisine and 1x10 units insulin glargine at 11:00 pm. We gradually increased insulin doses. The final insulin regimen doses were 3x10 units insulin glulisine and 1x16 units insulin glargine. We regulated dysglycemia of the patient. For screening, ophthalmological examination was performed and retinopathy was not detected. Linagliptin was added to the treatment on the fifth day of hospitalization to reduce the dose of insulin. We continued strict blood glucose monitoring. Palpable purpura like lesions, ranging from 0.3 to 1.5 cm in diameter, appeared in lower and upper extremities of the patient on the second day of linagliptin treatment (Figure 1). We did not take biopsy from lesions. After discontinuation of linagliptin, palpable purpura both in lower and upper extremities regressed gradually. We have received written informed consent from the patient. Combination therapies are commonly used in the management of type 2 diabetes. DPP-4 inhibitors may also be added to the treatment of type 2 diabetic patients taking insulin. Some studies have showed that an increased rate of hypoglycemia can be observed in patients with type 2 diabetes who have combination therapy with DPP-4 inhibitor and insulin (9). Therefore, in patients with type 2 diabetes having intensive insulin regimen, addition of an oral DPP-4 inhibitor may obligate to change the insulin doses. In addition to hypoglycemia, several adverse events, such as skin findings, may be detected in patients given oral DPP-4 inhibitors. Some post-marketing reports have shown that cutaneous reactions such as Stevens-Johnson syndrome are observed in patients receiving alogliptin (10). In one study, increased skin-related events were detected in patients receiving alogliptin compared with placebo; these were mostly pruritus and rash (11). Several reports have shown that bullous pemphigoid may also be observed in patients taking vildagliptin or sitagliptin (12). Sitagliptin has also been found to cause maculopapular drug eruption in some cases (13). One case report showed fixed drug eruption in a patient receiving sitagliptin therapy (14). Succurro et al. (15) reported that a patient with type 2 diabetes complained of loss of eyebrows and eyelashes 4 months after the initiation of sitagliptin/metformin combination treatment. Palpable purpura are non-blanching skin lesions ranging 0.3 to 1 cm in diameter and are clinical signs of cutaneous small vessel vasculitis. A list of medications, such as penicillin, antineoplastic agents, and anticonvulsants, may incite this finding (16). Some infectious agents such as hepatitis B or C virus may also be associated with cutaneous small vessel vasculitis (16). Numerous reports have been written on the relationship of palpable purpura with drugs, however, the number of diabetic patients with palpable purpura was caused by the use of oral antidiabetic agents was limited. Leukocytoclastic vasculitis has been reported in two diabetic cases taking metformin or glyburide (17,18), however, no cases of palpable purpura associated with use of DPP-4 inhibitors were reported in the literature. Psomadakis et al. (8) reported that a 60-year-old man developed blisters on his hands as a result of linagliptin treatment. The lesions resolved after discontinuation of the drug. Repeated exposure to the drug caused two large blisters on the left foot and resulted in secondary infection. 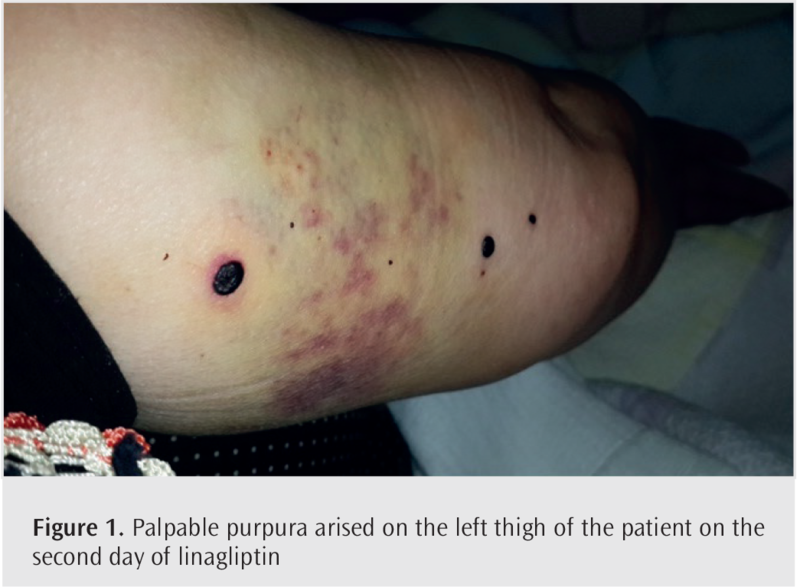 To the best of our knowledge, our case report is the first report of palpable purpura associated with linagliptin in the literature. Although linagliptin has the highest selectivity for DPP-4 enzyme, some effects on other DPP enzymes (especially DPP-8 and DPP-9) may cause musculoskeletal and dermatological adverse reactions during treatment with linagliptin. Metformin may be implicated for the development of skin reactions, but our patient had been taking metformin for ten years. To demonstrate leukocytoclastic vasculitis histopathologically, biopsy should be taken from palpable purpura lesions. We did not take biopsy specimen and clinically observed the patient after the discontinuation of linagliptin. Then, the lesions subsided gradually. Our patient also had been taking another medication with potential for cutaneous side effects. However, linagliptin was the only drug patient started to use just before the rash. We did not challenge the patient with linagliptin after resolution of the cutaneous reaction. In such cases, occurrence of the skin lesion after a re-challenge with the same drug strongly suggests the diagnosis of a drug-related skin reaction. New cases with skin findings thought to be associated with linagliptin should be reported, and further clinical studies examining the skin reactions of diabetic patients treated with linagliptin will clarify these issues. We presented this case as an abstract in “53th national congress of diabetes, 2017, Turkey”. Informed Consent: We have received written informed consent from the patient. Author Contributions: Concept - Ö.T., B.E., İ.Ş; Design - Ö.T., B.E., İ.Ş; Supervision - Ö.T., B.E., İ.Ş; Data Collection and/or Processing - Ö.T., B.E., İ.Ş; Analysis and/or Interpretation - Ö.T., B.E., İ.Ş; Literature Search - Ö.T. ; Writing Manuscript - Ö.T. ; Critical Review - Ö.T., İ.Ş. Špinar J, Špinarová L, Vítovec J. The TECOS, EXAMINE and SAVOR studies--how do they differ and what are their outcomes? VnitrLek 2015; 61: 976-83. Pi-Sunyer FX, Schweizer A, Mills D, Dejager S. Efficacy and tolerability of vildagliptin monotherapy in drug-naive patients with type 2 diabetes. Diabetes Res Clin Pract 2007; 76: 132-8. FDA. FDA Sitagliptin. 2009. Available at http://www.fda.gov/Drugs/DrugSafety/PostmarketDrug SafetyInformationforPatientsandProviders/ucm183768.htm. Chen XW, He ZX, Zhou ZW, Yang T, Zhang X, Yang YX, et al. Clinical pharmacology of dipeptidyl peptidase 4 inhibitors indicated for the treatment of type 2 diabetes mellitus. Clin Exp Pharmacol Physiol 2015; 42: 999-1024. Gabrilovac J, Čupić B, Zapletal E, Kraus O, Jakić-Razumović J. Dipeptidylpeptidase 9 (DPP9) in human skin cells. Immunobiology 2017; 222: 327-42. Eckhardt M, Langkopf E, Mark M, Tadayyon M, Thomas L, Nar H, et al. 8-(3-(R)-aminopiperidin-1-yl)-7-but-2-ynyl-3-methyl-1-(4-methyl-quinazolin-2-ylme thyl)-3,7-dihydropurine-2,6-dione (BI 1356), a highly potent, selective, long-acting, and orally bioavailable DPP-4 inhibitor for the treatment of type 2 diabetes. J Med Chem 2007; 50: 6450-3. Deacon CF, Holst JJ. Linagliptin, a xanthine-based dipeptidyl peptidase-4 inhibitor with an unusual profile for the treatment of type 2 diabetes. Expert Opin Investig Drugs 2010; 19: 133-40. Psomadakis C, Shahzad N, Katz J. Linagliptin-associated blistering and ulceration. BMJ Case Rep 2017; 2017. pii: bcr-2017-219998. Vilsboll T, Rosenstock J, Yki-Jarvinen H, Cefalu WT, Chen Y, Luo E, et al. Efficacy and safety of sitagliptin when added to insulin therapy in patients with type 2 diabetes. Diabetes Obes Metab 2010; 12: 167-77. Covington P, Christopher R, Davenport M, Fleck P, Mekki QA, Wann ER, et al. Pharmacokinetic, pharmacodynamic, and tolerability profiles of the dipeptidyl peptidase-4 inhibitor alogliptin: A randomized, double-blind, placebo-controlled, multiple-dose study in adult patients with type 2 diabetes. Clin Ther 2008; 30: 499-512. Nauck M, Ellis G, Fleck P, Wilson C, Mekki Q; Alogliptin Study 008 Group. Efficacy and safety of adding the dipeptidyl peptidase-4 inhibitor alogliptin to metformin therapy in patients with type 2 diabetes inadequately controlled with metformin monotherapy: a multicentre, randomised, double-blind, placebo-controlled study. Int J Clin Pract 2009; 63: 46-55. Attaway A, Mersfelder TL, Vaishnav S, Baker JK. Bullous pemphigoid associated with dipeptidyl peptidase IV inhibitors. A case report and review of literature. J Dermatol Case Rep 2014; 8: 24-8. Nakai N, Katoh N. Maculopapular-type drug eruption caused by sitagliptin phosphate hydrate: a case report and mini-review of the published work. Allergol Int 2014; 63: 489-91. Gupta M, Gupta A. Fixed drug eruption to sitagliptin. J Diabetes Metab Disord 2015; 14: 18. Succurro E, Palleria C, Ruffo M, Serra R, Arturi F, Gallelli L. Loss of eyebrows and eyelashes during concomitant treatment with sitagliptin and metformin. Curr Drug Saf 2017; 12: 10-2. Martinez-Taboada VM, Blanco R, Garcia-Fuentes M, Rodriguez-Valverde V. Clinical features and outcome of 95 patients with hypersensitivity vasculitis. Am J Med 1997; 102: 186. Ben Salem C, Hmouda H, Slim R, Denguezli M, Belajouza C, Bouraoui K. Rarecase of metformin-induced leukocytoclastic vasculitis. Ann Pharmacother 2006; 40: 1685-7.
Henley JK, Blackmon JA, Fraga GR, Rajpara A, Maz M. A case of glyburide-induced leukocytoclastic vasculitis. Dermatol Online J 2013; 19: 19619.